Talks to modernize the 1994 trade pact started in August 2017 but have dragged on much longer than expected as Canada and Mexico pushed back against far-reaching U.S. demands for reform. President Donald Trump has said he will walk away from NAFTA unless major changes are made. In a renewed push, Mexican and U.S. cabinet ministers held a series of meetings in Washington over the past week in a bid to work out their differences. One Mexican official expressed optimism that some kind of agreement could be reached by the end of the month. 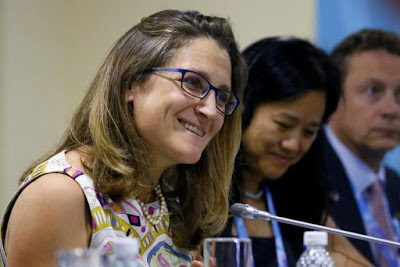 “I and Canada are very, very keen to get it done as quickly as possible,” Freeland told reporters on a conference call. She did not answer directly when asked whether the end of August was a realistic deadline.